Nord Drivesystems has developed products that comply to safety and hygiene standards and can handle harsh washdown environments. The products are available in size ranges suitable to every industry – from food and beverage and pharmaceutical right through to wastewater and mining. Products are locally assembled and Nord has a large local stock holding and service team trained to help customers with commissioning and service. 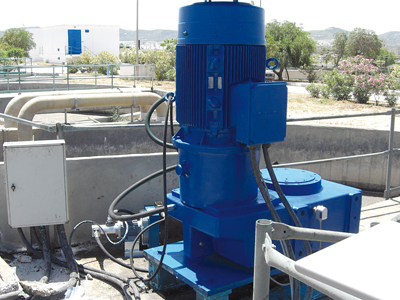 The company recently supplied product at a wastewater treatment at a municipality that supplies approximately 2.5 million people in a metropolitan area with process water. To enable the bacterial decomposition of dirt particles, the wastewater needed to be oxygenated by constant churning. Two large, geared motors propelled the mixers around the clock. In the outdoor facility, temperature vary throughout the year. The facility contained drive technology that was nearly 30 years old and needed to be replaced step by step. The original suppliers had discontinued the lines, which made spare parts hard to come by. Also, the originally installed gear units required maintenance to a problematic extent. In particular, the fluctuations in temperature have frequently affected the lubrication. Siemens motors were installed, and have since proven themselves during continuous operation. Nord used a high-quality synthetic long-life lubricant for the helical shaft gear units. It withstood the ambient temperatures considerably better than mineral oil – with the latter, the oil film would break down at high temperatures, resulting in increased wear and tear. Each gear unit required 210 l of oil, which had to be changed after approximately 20,000 hours of operation. Other manufacturers stipulated shorter maintenance intervals, which made a difference at a price of the oil. An oil cooling system additionally increased operational safety in the Nord gear units – a temperature sensor constantly monitored the temperature of the lubricant and activated the cooling system as soon as a configurable limit was exceeded. In this application, the limit is 60°C. Heated oil was then pumped out, cooled by an oil cooler and returned to the gear unit. When the temperature fell below 40°C the cooling system switched off automatically. Currently, there are two helical shaft gear units with a 132kW performance from Nord’s SK 12382VZ series that are installed at the waste water treatment plant. They are used in combination with Siemens motors via IEC adapters. Nord’s helical shaft gear units are available as two- or three-stage basic types with hollow or solid shafts, in foot-mounted, flange-mounted, or face-mounted versions – each with the same housing. Suitable for integration into limited installation spaces, they can be combined with many components from the modular Nord system. Atex models and models with IP55 or IP66 protection are available on request for all types. All gear units are manufactured according to the UNICASE concept, originally developed by Nord in 1981. This enables maximum performance for small gear dimensions and ensures operational safety, high efficiency, high output torques, high resistance to axial and radial loads, low-noise operation, low maintenance and a long lifetime.